This blog continues the discussion of Jansson’s blog Muehlenkamp mangles mass cremation calculations, commenced in the previous blog of this series. The information about economies of scale offering a reduction of fuel requirements of one third (from 1500 to 1000 kg for a cow) gives us yet another method for estimating fuel requirements: we can take the fuel requirements of cremation pyres in India (variously reported, but clearly several hundred kg) and reduce the value by one third to obtain an estimate for the fuel requirements for mass pyres of humans. The result of this procedure is again in agreement with revisionist claims about fuel requirements. NEW DELHI: Over 40 million trees are consumed annually in the conventional Hindu system of cremation, leading to the denudation of 1,500-2,000 sq km of forests. It also results in the emission of 7.5 million tonnes of carbon dioxide, adding to global warming and polluting surroundings with suspended particulate matter. Emphases in the above quotes are mine. 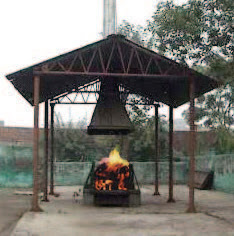 A SWEET whiff of burning flesh hangs over India's open-air cremation grounds. The reason is that the traditional funeral pyres preferred by Hindus are extremely inefficient. On a windless day disposing of the remains of a fully-grown Hindu can take six hours and 500kg of wood. With around 8.5m Hindus expiring each year in India, these pyres exact a huge environmental toll. By one estimate, they consume around 50m trees a year, producing 500,000 tonnes of ash and 8m tonnes of carbon dioxide. The "Revisionist" yarn about traditional Hindu cremation actually has a long white beard and has even been addressed in one of the HDOT myth/fact sheets already. One wonders why Jansson still uses it. He must be desperate. Jansson doesn’t like my ratios for the requisite mass of dry wood and fresh wood because they "differ by only some 10%, which is manifestly absurd". 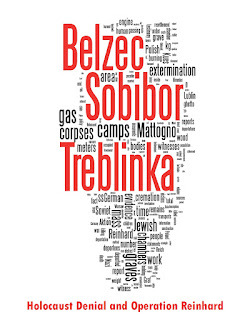 My error is supposed to have been that I "assumed that the weight of a cord of dry wood is equal to the weight of a cord of green wood", and this is supposed to follow from a glance at my calculations in the blog Belzec Mass Graves and Archaeology: My Response to Carlo Mattogno (4,2). These calculations were published about 6 years ago, and I would have to go through them to establish if Jansson’s claim is correct, which I don’t feel like doing as it is for Jansson (otherwise so fond of showing tables with red error marks) to demonstrate (and not just claim) that I made the error he attributes to me. In any case, Table 19 in the aforementioned blog doesn’t look like I assumed equal weights for volume units of dry and green wood, for the weight value in the column "Weight of fresh wood equivalent kg" is 10 % higher than the weight value in the column "Weight of dry wood equivalent kg". This difference, if I remember correctly, is related to information on this page whereby "Heat values of Cords with dry wood can be estimated by adding the green wood cords values with approximately 10%". 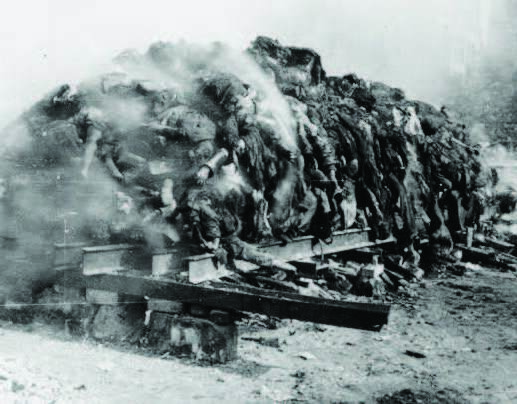 The 56 cubic meters of firewood, which I considered to weigh 19,718 or 21,692 kg depending on whether they consist of dry wood or green wood, are from Mattogno’s article Bełżec or the Holocaust Controversy of Roberto Muehlenkamp, where he stated the fuel requirements of this cremation to have been 350 railway sleepers, 56 cubic meters of firewood, 10 tons of straw and 60 tons of coal and naphta. A sheep of medium build weighs 60-75 kilo, a heavy one 75-90 kg. Assuming the maximum weight, the 818 carcassed would have weighed (818 × 90 =) 73,620 kg and the firewood required to burn them would have corresponded to (270.200: 73.620 =) ~ 3.67 kg of firewood per kilo of carcass. Jansson argues that I shouldn’t have used the weight per sheep assumed by Mattogno (90 kg) for my calculations because Mattogno had used it "in order to be as generous as possible to his opponent – i.e. to assume an excessive weight and show that his arguments went through nevertheless, and therefore show that with the correct weight they would be even more valid". The weight is supposed to be excessive because "during the 2001 UK FMD epidemic, sheep were assessed at an average weight of 50 kg" and "the weight from the UK is the best available estimate, as it comes from the same year and a neighboring country". In what must be another case of self-projection Jansson even babbles about one of my "favorite methods of deceit" in this context. First of all, in order to demonstrate that Mattogno’s wood or wood equivalent calculations were mistaken and correct calculations resulted in a lower fuel to body mass ratio under the same body mass assumptions, I of course had to use Mattogno’s body mass assumptions and no other. Second, there is nothing in Mattogno’s text to indicate that he was being "as generous as possible to his opponent"; he was simply using what he claimed to be the highest of a range of values given by his source, which would have been the appropriate thing to do if his source had really pointed to these values as being the highest ones for sheep cremated in France (and thus probably being of a French breed). Now, Mattogno’s source for sheep weights gives the following adult weights for foreign breeds raised in Italy: Île-de-France, 90-120 kg for rams, 60-70 kg for ewes; Dorset Down: 70-80 kg for rams, 50-55 kg for ewes; Suffolk, 100 kg for rams, 80 kg for ewes. Which of these breeds is likeliest to have been burned in March 2001, near Lille, France? That’s right, the Île-de-France, a breed of sheep native to the French region of Île-de-France near Paris, one of the top meat breeds worldwide, and most probably the breed that would be raised in the region of Lille, which is pretty close to Île-de-France and, unless I missed something here, has no breeds native to the region. The animals burned were 600 rams and 218 "other sheep". The assumption least favorable to Mattogno’s argument would have been that the 600 rams weighed 120 kg apiece (the maximum weight stated by his source) and the "other sheep" were ewes weighing 70 kg apiece. So if Mattogno had been "as generous as possible to his opponent", as Jansson claims, he would have assumed a total weight of 72,000 kg for the rams (pretty close to the 73,620 kg he did assume) and of 15,260 kg for the ewes, making a total of 87,260 kg for all 818 sheep and an average weight of 107 kg per sheep. The fuel to body mass ratio would then, according to Mattogno’s flawed wood or wood equivalent calculations, have been (270,200÷87,260 =) ~ 3.1 kg of firewood per kilo of carcass, instead of (270,200÷73.620 =) ~ 3.67 kg of firewood per kilo of carcass. With the corrected total wood or wood equivalent values in my Table 19, the ratios would have been (177,330÷87,260 =) ~ 2.03 kg of firewood per kilo of carcass instead of 2.41 (green wood) and (161,192÷87,260 =) ~ 1.85 kg of firewood per kilo of carcass instead of 2.19 (dry wood). As long as we don’t know the actual weights of the animals, these ratios remain a possibility. This means that Jansson produced a lot of sheep dung when claiming that Mattogno was being "as generous as possible to his opponent". He should have checked Mattogno’s source before making this silly claim. Poor show again, Mr. Jansson. Ah, and last but not least: whatever weights whoever assessed in the UK during the 2001 FMD epidemic, in whatever context and for whatever reason, are not the "best available estimate" of weights in a specific sheep cremation case outside the UK, and the "same year" and "neighboring country" arguments are also not exactly pertinent. They are one of several possible approximations at best. From a serious study of the literature relating to the burning of animal carcasses during epidemics, it turns out that the equivalent given for a human corpse weighing 70 kg is 140 kg of firewood, thus 2 kg of firewood per 1 kg of meat. Mattogno, Controversie, p. 30, referring to Heinrich Köchel, «Leichenverbrennung im Freien», in: Vierteljahreshefte für freie Geschichtsforschung, Year 8 Nº 4, December 2004, pp. 427-432; Mattogno, Controversy. Mattogno apparently assumes that Köchel considers the average weight of a pig to be 140 kg and the average weight of a human being to be 70 kg, though this doesn't become apparent from Köchel's article. As the weight of a domestic pig ranges from 50 to 350 kg , the data in Köchel's table don't tell us much without knowing the weight of the animals burned that each of his sources mentions or considers, which in turn makes Köchel's dismissing the highest and the lowest value seem somewhat arbitrary, all the more so as the latter is based on recommendations made by an authoritative source on the subject, the Food and Agriculture Organization of the United Nations (FAO), which is furthermore the basis of Köchel's conversion of animals other than swine into swine equivalents. As I didn’t quote or refer to Köchel regarding the food to body mass ratio of 2:1, Jansson has made a fool of himself for the second time (the first was when he claimed that Mattogno had been "as generous as possible to his opponent", see above) by accusing me of having "using a number given as a rhetorical concession as if it were the correct value". Congratulations, Mr. Jansson! Following yet another sadly failed attempt to smear his opponent, Jansson tries to sanitize Köchel, by referring to his favorite FMD weight figures (500 kg a bovine, 100 kg a pig, 50 kg a sheep) and arguing, based on the high fat content of pigs, that the equation should be not 1 pig = 2 Jews as per Köchel’s "exceedingly generous" assumption, but rather 1 sheep = 1 Jew, thus doubling the fuel to body mass ratio that Mattogno derived from Köchel’s considerations. Convenient as this equation is for Jansson’s articles of faith, it also has several flaws. The first, as already pointed out in the previous installment’s first update, it that it is unlikely that the authors who published the rule of thumb whereby 1 cattle corresponds to 4 pigs or 4 shorn sheep for the purpose of fuel requirements had Jansson’s favorite weight figures in mind, at least as concerns pigs and sheep. What is more likely (as there’s no reason why pigs and sheep, despite their relatively higher fat content in comparison to that of bovine cattle, should require more fuel on a per-weight-unit basis than bovine cattle) is that the distribution was based on an assumed weight ratio of 1:4 between bovine cattle and pigs and between bovine cattle and sheep. This, incidentally, also seems to be suggested by Köchel’s table. The second is that, while the aforementioned rule of thumb may hold true in most cases, it cannot be applied if, in the specific cremation case assessed, the weights of the carcasses cremated differ considerably from what corresponds to the rule of thumb, e.g. where burned pigs or sheep are mature animals from a breed in which such animals are heavier than what the rule of thumb considers to be the average for the species. Without knowing the weights of the animals in each case, calculations of fuel requirements per body mass are largely speculative approximations that may turn out to be completely mistaken. The third flaw is that Köchel’s calculations are themselves flawed, in that he excluded the Caldbeck data and the FAO data without a reasonable justification. Especially the exclusion of the latter, i.e. the very set of data from which he took his 1 bovine = 4 pigs = 4 sheep rule of thumb (and which can be assumed to have been based on a wide range of experience, or on another source drawing on such experience), with the pretext that the value for the equivalent of one pig is too low, comes across as an artifice meant to obtain a desired average – moreover as the FAO data are more or less in line with three other sets of data, those of the Heddon-on-the-Wall cremation, the first Oswestry cremation and the cremation at Bondues, France. If Köchel wanted to exclude cases that seemed unrepresentative, the likely candidates would have been Caldbeck alone or Caldbeck and DOH, not Caldbeck and FAO. The table below is based on Köchel’s figures in the columns "Schweineäquivalent" (pig equivalent) and "Holzäquivalent [l]" (wood equivalent in tons, which I converted into wood equivalent in kg by multiplying each value with 1,000). The calculated values in the column "Wood per pig kg" are slightly but not much different from the values in Köchel’s table, the difference probably resulting at least chiefly from the fact that Köchel used the wood equivalent values in kg yielded by his calculations, even though he only showed rounded values in tons in his table. The values in this column "Wood per pig kg" are then, in the columns to the right of it, divided by three assumed pig head weights: 140 kg (which seems to correspond to Mattogno’s understanding of Köchel’s paper) 125 kg (which corresponds to my understanding as to the pig and sheep weights considered when establishing the 1 bovine = 4 pigs = 4 sheep rule of thumb) and 100 kg (which is Jansson’s favorite pig weight figure related to the 2001 FMD epidemic). The averages include those taken by Köchel ((a) and (b)) and the ones that I think Köchel should have taken ((c) and (d)). The latter two yield lower food to body mass ratios than the former. Average (c) (without Caldbeck) yields ratios of 1.91, 2.14 or 2.67 kg of wood per kg of carcass, depending on whether the assumed individual pig weight is 140, 125 or 100 kg, while average (d) (without Caldbeck and DOH) yields ratios of, respectively, 1.63, 1.83 and 2.29 kg of wood per kg of carcass. However, I don’t consider these averages very meaningful, at least not more meaningful than the FAO ratios I expect to be based on a wide range of experience (respectively 0.89, 1.00 and 1.25 kg of wood per kg of carcass). More interesting is the fact that there are three cremation cases (Heddon-on-the-Wall, first Oswestry and Bondues, France) plus one guideline presumably based on a wide range of experience (FAO) that yield fuel to body mass ratios below 2:1, and even close to or below 1:1 if pig weights higher than 100 kg are considered. This proves that it is possible to cremate carcasses in open pyres with fuel to body mass ratios below 2:1 or even close to or below 1:1. Such possibility alone means that Mattogno and his epigones cannot provide proof that it is impossible to cremate carcasses in open pyres at fuel to body mass ratios below their desired 3.5:1 ratio. And this, in turn, means that they fail to meet the impossibility/impracticability proof requirements outlined in this series’ 1st installment, before we even consider the differences between open air cremation of carcasses and corpse cremation at the AR camps that were pointed out in the 2nd installment of this series. But a simple pile of corpses put on a grid of rail tracks, however, has nothing to do with the Mokshda cremation facility. In the latter case the principle of air flow around the corpses is ensured by the special structure of the grid and by the presence of a single corpse, with the possibility to regulate the combustion with the help of a movable chimney. 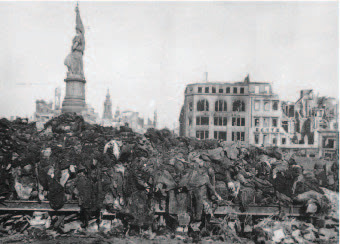 In the case of the Dresden pyres the air flow only took place around the pile as a whole and affected only the external parts of the corpses. It is clear that the purpose of the pyres in this case was not incineration, but the partial carbonization of the bodies for hygienic reasons. Mattogno may be right in that air circulation is better in the MGCS, and the movable chimney to regulate combustion is also an improvement over the Dresden pyres. But this doesn’t mean that the MGCS has nothing to do with the Dresden pyres; it just means that it is an improved open air pyre used for individual as opposed to mass cremation (see photos below, courtesy of Mattogno, as above pp. 1365 and 1367). Mattogno’s caption: "Illustration 12.12: Cremation apparatus Mokshda. From: www.thehindu.com/life-andstyle/society/article3008863.ece"
Mattogno’s caption: "Illustration 12.13: Cremation apparatus Mokshda. From: Michele Clausi, Vita, morte e biossido di carbonio: la pira sostenibile, in: www.greenme.it/informarsi/ambiente/298-vitamorte-e-biossido-di-carbonio-la-pira-funebresostenibile"
Mattogno’s caption: "Illustration 12.16: Corpses pyre in Dresden. “Image 8.5” of Muehlenkamp (p. 488)"
Mattogno’s caption: "Illustration 12.17: Corpses pyre in Dresden. From: http://www.dhm.de/lemo/objekte/pict/ph003739/index.jpg"
As to Mattogno’s claim that the Dresden pyres only produced "the partial carbonization of the bodies for hygienic reasons", I have pointed out here and here (among other places) that this claim is in contradiction with photographic and (other) documentary evidence whereby the cremation result of the Dresden pyres was at least far closer to complete combustion than Mattogno is prepared to admit. Jansson goes on nitpicking that my source mentioning the first pyre built by Vinod Kumar Agarwal in 1993 says that this pyre burned ""about 100 kg", not "100 kg"". Poor soul. He then derides my source as "a piece of low-grade promotional journalism, obviously written without any real research (basically a regurgitated press release)" and claims that a "more serious report", cited by Mattogno on p. 1227 of the magnum opus (I think he means p. 1363) "gave the fuel consumption as 150 kg per body". At the crematorium they came across an eco-friendly cremation system Mokshda, using which they were told could save 300 kg of the wood. They did exactly that, used 100 kg of the wood and took back the rest. But the makers of Mokshda aren't as lucky every time. People are not willing to listen so readily. The figures given in the article, first 100 kg and then 150 kg, can be conciliated by assuming that the fuel requirements are not the same in every cremation and 150 kg per corpse is a maximum. Before building its latest pyres—including the dozen currently functioning—the NGO consulted Hindu priests on all aspects of their design. 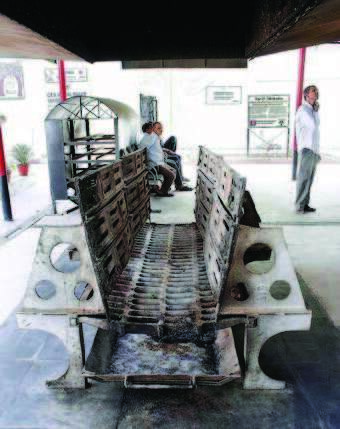 Among several changes that resulted, it stopped making its pyres in iron, which is an “unclean” metal for Hindus. It includes an icon of the Hindu god Shiva with each pyre, and has an education programme to help persuade traditionalists of the environmental evils of a conventional burning. These are current values or projections for individual cremation. It may be more difficult to achieve the same air flow quality in multiple cremation, but on the other hand, wouldn’t the economies of scale, mentioned in the previous installment (which Jansson would apply to traditional Hindu cremation, so he can’t have any objections to applying it to something that is more similar to burning corpses on a grate like at Dresden and the AR camps) reduce fuel consumption, perhaps by one-third (i.e. from 150 kg to 100 kg, from 100 kg to 67 kg, or from the projected 70 kg to 47 kg per corpse)? Looks like a possibility to be taken into consideration. With this I reach the end of my discussion of Jansson’s blog Muehlenkamp mangles mass cremation calculations, and the conclusion doesn’t look good for Jansson. If his objective was to show that "in every single one of his examples, Muehlenkamp either made a mathematical error, an inadmissible assumption, or ignored vital related information", he has failed disastrously. Additionally he has shot himself in the foot (besides making a fool of himself) with his Mattogno/Köchel claims discussed in the present installment. Whether alone or on top of having brilliantly exemplified the basic dilemma of "Revisionism" outlined at the beginning of this series, that’s quite an achievement indeed (even by Jansson’s standards). And I look forward to more such achievements as this blog throws Jansson into another fit of rage, which I presume it will. The present blog eventually did lead to another of Jansson’s freak-outs, though Jansson made a commendable effort to control himself for a while and only opened up when some ironic remarks written yesterday made him lose his bearings once more. In his anger about these remarks he produced this piece, in which he forgot about the feigned civility of his "Memo" series and displayed his obnoxious self in all "splendor". Said piece starts with a whole paragraph in which he calls his opponent dumb (citing Schiller, who would probably be rotating in his grave if he knew who he is being invoked by). Apparently Jansson hasn’t yet realized that deriding his opponent as "dumb" is counterproductive. Readers may wonder why Jansson, who pretends to be so smart and knowledgeable, has been cutting such a sorry figure against his "dumb" opponent. To be fair, one must give Jansson the benefit of assuming that this "dumb" bluster is not just a hysteric’s uncontrolled outburst, but also pursues a rational objective: by claiming that he will confine himself to what he calls "the essential corrections" and "ignore a number of stupid things that Muehlenkamp says so as to keep some focus to the debate", Jansson gives himself a pretext (however lame, at least in the eyes of everyone except the faithful "Revisionist" sheep who uncritically swallow whatever Jansson writes) for making a fuss about those parts of this blog he thinks he can make a fuss about and ignoring the others, especially my demonstration of his having shot himself in the foot with his Mattogno/Köchel act. 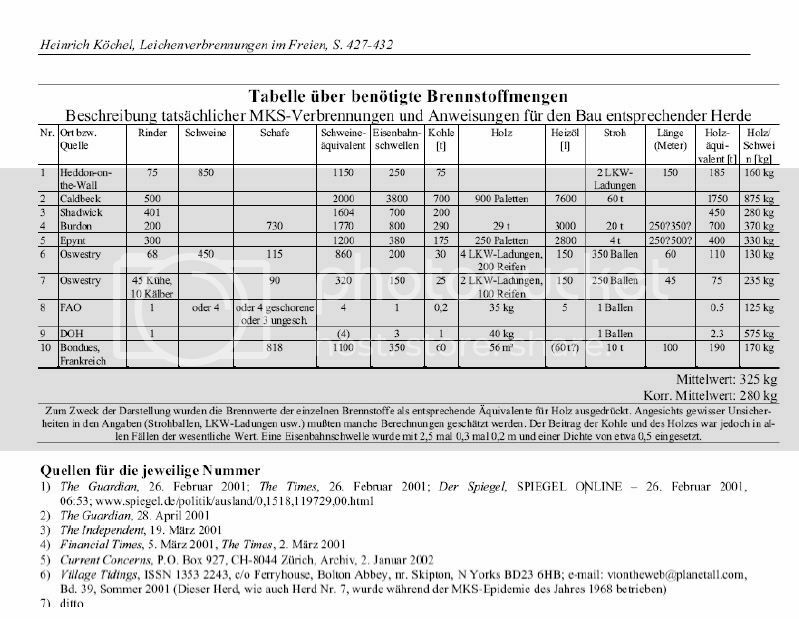 Why, and I was looking forward to Jansson’s correcting the calculations in Table 19 of my blog Belzec Mass Graves and Archaeology: My Response to Carlo Mattogno (4,2) (in which I considered 21,692 kg of fresh wood to be necessary for providing the same energy as 19,718 kg of dry wood, based on a source whereby the heating value of dry wood exceeds that of green wood by about 10 %), and providing the calculations he considers accurate. Apparently Jansson is unable to do that, so he has to console himself and his faithful sheep with another of his "analogy" sermons in support of his contention that I had "assumed that the weight of a cord of dry wood is equal to the weight of a cord of green wood" (which was obviously not what I had done). How about cutting the crap and showing what you consider to be the correct math, Mr. Jansson? Actually not all pyre cremation is inefficient. Pyre cremation is inefficient if done by merely piling up wood and putting a carcass or corpse on top, like in "these experimental cremations", in Hindu cremation pyres or, as we’re at it, in what German engineer Wilhelm Heepke, who I first referred to here and then here (in each case after one of Mattogno’s articles) called the "simplest procedure", burning a carcass on a pyre of firewood inside a pit. 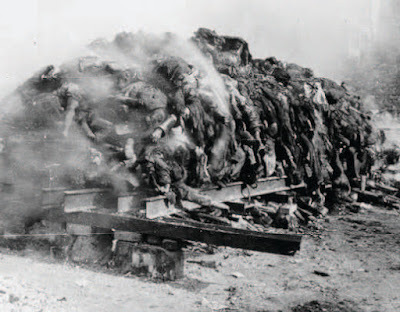 The "simplest procedure" was rather fuel-inefficient, quite unlike the experiments of Dr. Lothes and Dr. Profé, also mentioned by Heepke, in which the carcass was placed on a grate above the fire (like in the AR camps, on the Dresden Altmarkt and, for individual cremation, in the Mokshda Green Cremation System). Regarding the Mokshda Green Cremation System (MGCS), Jansson stomps his feet and yells that he "cited perfectly clearly" this source from Mattogno. Actually, as mentioned earlier in the present blog, Jansson didn’t even get the pages of MGK’s magnum opus right when referring to a "more serious report" cited by Mattogno. So he has only himself to blame if I understood that he was referring to Mattogno’s quote on p. 1363 from the source given in footnote 2990, i.e. to the article "A thought for the dear departed" that was published on March 18, 2012 10:26 IST on the website of The Hindu. The source that Jansson claims to have "cited perfectly clearly" is referred to by Mattogno in footnote 2991 on p. 1365, but not as concerns the 150 kg of wood per cremation stated in that source. Mattogno (p. 1366) refers to a passage I quoted from that source in footnote 110 on page 463 of the HC critique, which can also be read here. The above means that Jansson provided everything other than a "perfectly clear" citation, and it would have been an easy thing for Jansson to simply admit this. But then, Jansson (just like his beloved Führer and other male hysterics aptly characterized by Peter Bamm) is not of the kind who would be able to admit an error. Before again repeating Mattogno’s argument that "the system is entirely different from the kind of open air burning alleged to have taken place at the Reinhardt camps" (actually, as pointed out earlier in the present blog, the MGCS is an improved open air pyre used for individual as opposed to mass cremation, thus not something entirely different from the pyres used at the AR camps and at Dresden), Jansson argues that a request for project funding would be "hardly a source likely to understate said project’s achievements" when reporting a fuel consumption of 150 kg of wood per body. This is hardly a compelling argument, for one might as well argue that a funding request would present conservative data about the project’s achievements to avoid an eventual accusation of having overstated such achievements and thus tried to obtain funds through false information. This, in turn, means that the information from respectable journalistic sources (The Hindu and The Economist), suggesting that 150 kg of wood per corpse is a maximum and lower consumptions are possible, is not necessarily "of little value" as Jansson would like it to be. Besides, neither of these sources is referring to the 1993 "elevated brazier" that is mentioned here. c) Jansson’s Throckmorton source is about a mass burial site, not about mass cremation let alone fuel requirements in mass cremation. This means that Jansson still has no evidentiary support for his thesis that the 1 bovine = 4 pigs = 4 sheep equation applies with weights of 500/80/40 kg or 500/100/50 kg per head. Nice try, Mr. Jansson, but you would be more convincing if you could provide an evidenced-backed explanation why burning sheep should require up to 2.5 (or more) times as much fuel on a per-weight-unit basis as burning bovine cattle, even though the former animals tend to have a higher fat content than the latter. No doubt Muehlenkamp will persist in his unreasonable assumptions despite this information. Such is his custom. As the facts close in around him, he resorts to more and more absurd speculative numbers to make things work, at least in his fantasy world. Facts closing in around me, he says. What a hoot. If Jansson had facts to offer (as opposed to mere nitpicking and inconclusive "impossibility" arguments against facts inconvenient to his ideological beliefs), we wouldn’t be having these amicable conversations. As to "unreasonable assumptions", here’s an example of what is actually an unreasonable assumption: an unreasonable assumption is the assumption that the "transit camp" theory is not a load of trash even though, among other things, not a single name of a "transited" Jew has surfaced in 72 years since the AR camps were closed down. That is as unreasonable an assumption as can be, one that would only be entertained by a fanatic living in a fantasy world (look who’s talking) of unshakeable, dogmatic ideological convictions. Conspiracy theorists tend to be unable to "notice that the small inconsistencies in the accounts which they reject are dwarfed by the enormous, gaping holes in logic, likelihood and evidence in any alternative account". Jansson is no exception to this rule. Changing the subject from cremation to burial, Jansson links to an old Axis History Forum post of mine and argues that back in 2002 I "endorsed a maximum burial density of 8 corpses per cubic meter – the same figure revisionists have used". Yawn. First of all, I said nothing a "maximum" burial density. Second, "Revisionists" of the Jansson variety have nothing to do with revisionists (if you want an example of a revisionist in the proper sense of the word, I consider the late Götz Bergander to have been one, on account of his having refuted Dresden bombing myths based on solid evidence and arguments). Third, my 2002 estimate was made, IIRC, before I learned about Mattogno’s calculations rendered i.a. here, the calculations made by Alex Bay and Charles Provan’s experiment (plus, as we’re at it, the burial density projections of Young, Marsland and Smith, which Jansson unwittingly led me to – see this blog’s section 2 and the respective update). 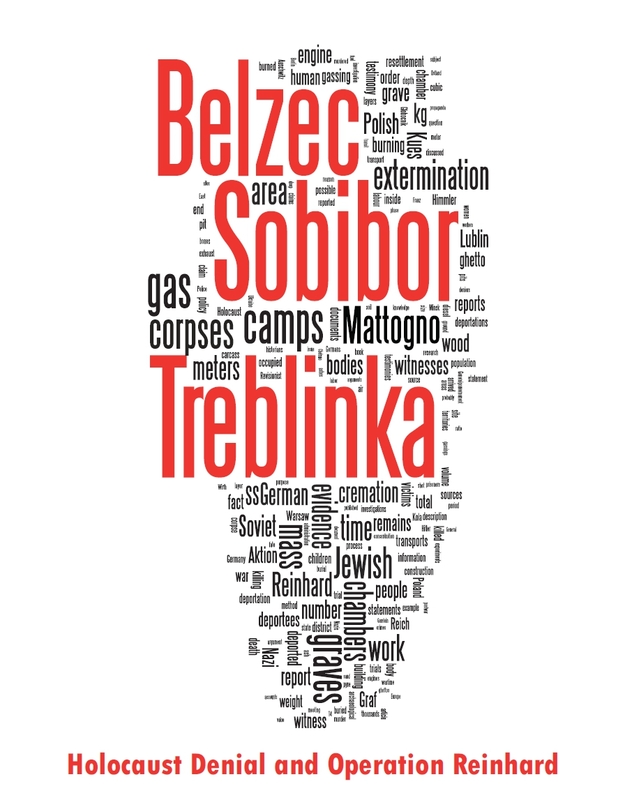 All of which, to be sure, is of less interest if the 33 mass graves identified at Bełżec by Prof. Kola’s archaeological team were the not only mass graves in that extermination camp – which may well be the case. His more recent – and absurd – figures are the result of making stuff up as he goes along in order to defend his a priori conclusions. Yeah, sure. My "absurd" figures are so "absurd" that Jansson has not yet been able to refute them, go figure (on the contrary, a source provided by him further backed them up). As to "making up stuff as he goes along", Jansson must be projecting his demonstration, pointed out at the beginning of this update, that he’s an inveterate liar who will pile falsehood upon falsehood as he desperately tries to cover up the first falsehood. And as to "a priori conclusions", it’s rather amusing to read this from someone whose entire stance is as obviously based on pre-ordained articles of faith as Jansson’s.